Random Graffiti of the Week: Space Invaders! M@ Random Graffiti of the Week: Space Invaders! If you take the slightest bit of interest in your surroundings while walking around the streets of London, you will have noticed those strange, mosaic space invaders that hug the corners of buildings. The aliens are everywhere. All over the world. 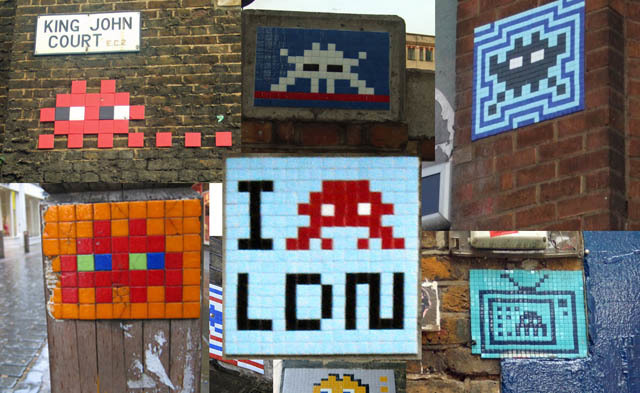 There are perhaps 75 throughout London alone, according to the space invader website. Recently, the fourth wave invaded on our streets, and so we thought it was about time we tried to map them. Zoom in, scroll around and click the markers to see pictures. This Platial map is 'Open' meaning that you can add your own alien encounters. Some of the photos used are from Creative Commons Flickr sources. Credits can be found by clicking through to the Platial map.